ALLYSA'S DREAM (Robert Piątek 2017) Poland. TB, 30" (76 cm), M.
Ruffled flowers have snow white standards and style arms. White falls are glazed pink and have a 1 mm yellow edging; dark brick red beards. Pronounced sweet fragrance! SERENE LADY (Don MacKendrick 2017) Colorado .TB, 28"-30", EM-M. Serene indeed! 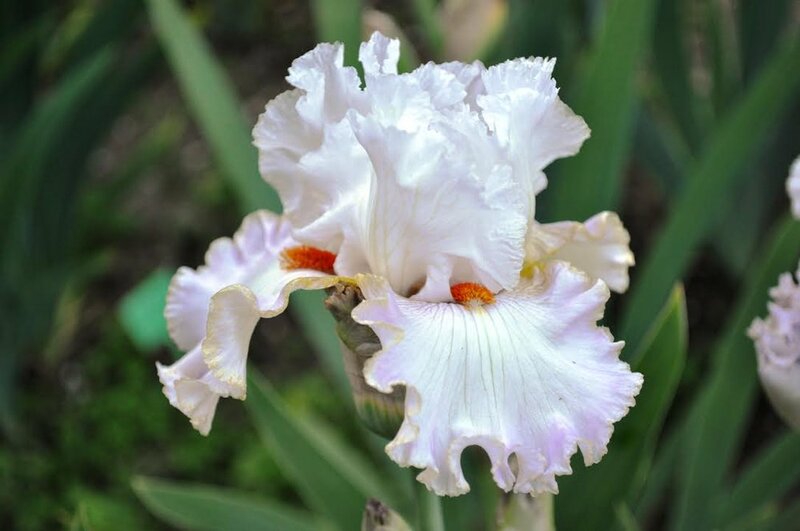 This lovely iris blooms heavily on a vigorous, healthy plant. Essentially a light heliotrope (HCC 636/3) self with with the edges of the style arms and hafts tinted tangerine, giving the heart of the flower a soft inner glow. The standards are upright, the flaring falls delightfully ruffled and set off by tangerine beards. Foliage is purple based. Born and raised in western Colorado where growing conditions range from arctic winters to blazing hot summers. SOLEMN PAUSE (Gary Biggs 2017) New Mexico. TB, M, 40". Standards are blue-pink; falls are creamy blue pink with gray texture veining and orange beards. Heavily ruffled flowers are displayed on thick, well branched stalks with 7-9 buds. Large, erect, vigorous plants with purple based foliage produce a long bloom season. Very pod fertile and proving to be a good parent.